From time to time, we ask our customers to write for our blog. 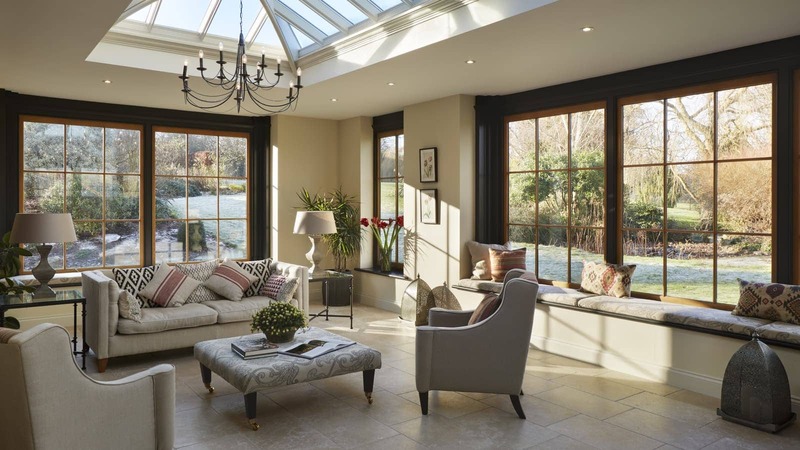 Here’s Mrs. B on how her new orangery has brought character to her home. Our house is a classic late 1960/70s build – a large rectangular home with spacious rooms, ample light but lacking in character. The existing conservatory we had was a standard, white uPVC hexagon that neither matched the shape nor the style of the rest of the house. The roof had degraded over time and often leaked, therefore, although it was a particularly large conservatory, we never used it, resulting in a lot of wasted space. Our aim was to replace the time-worn uPVC with a more permanent, versatile and long-lasting extension. Another problem we found with the conservatory was that it was plagued with the classic pitfalls of being too hot in the summer and too cold to enjoy during the winter months. As a result, we were keen to move away from another fully-glazed product and instead create a space that could be used all year round. 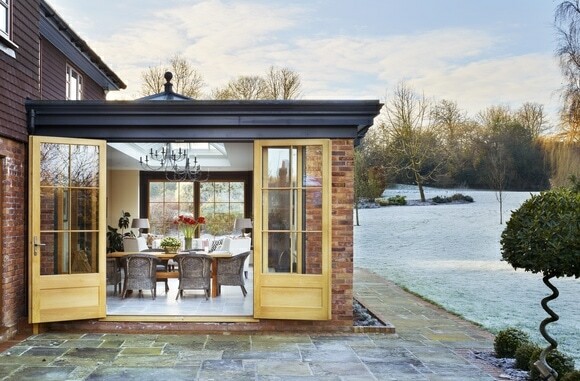 An orangery seemed the perfect option as the combination of brick and timber offered a cosy, enclosed environment whilst the large windows and elegant roof lantern would ensure the space was still flooded with natural light. We looked at two to three different companies when considering suppliers, however, what sealed the deal with Westbury Garden Rooms was the care and meticulous attention they gave us right from the very first point of contact. Rather than sitting us down with a few glossy photographs of ‘off the shelf’ orangery models, Westbury arranged for us to visit one of their previous customers to see first-hand the quality craftsmanship and level of service we would expect to receive – immediately we knew we were in safe hands. From then on, the effort and enthusiasm the designers put in throughout the entire process was exceptional. 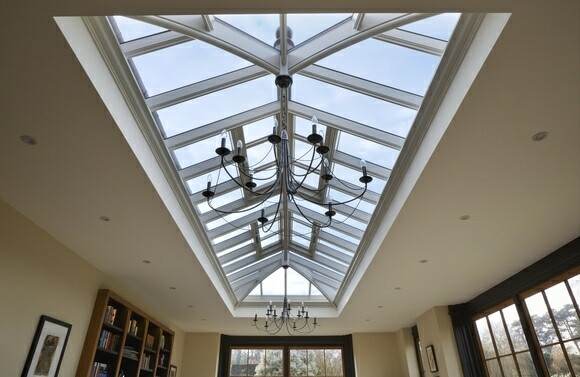 They really listened to our ideas and created a series of bespoke designs, refining them several times to ensure our orangery was the perfect fit for both our lifestyle and our home. Our orangery is in constant use throughout the day and has become an integral part of our downstairs living area. We prefer to eat in the orangery when we can as it’s such a bright space with beautiful views of the garden. We chose a pocket door for the internal entrance to the orangery rather than a traditional hinged door. 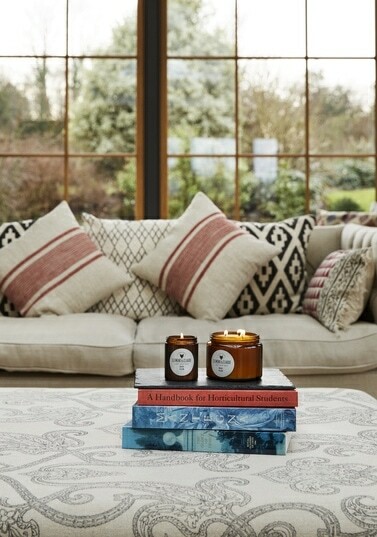 This is great for when we’re entertaining as it allows us to completely open up the space as a natural extension to the rest of the house and yet when I want to use the space as a study, I can still close myself off in the orangery, creating a peaceful sanctuary from any distractions. 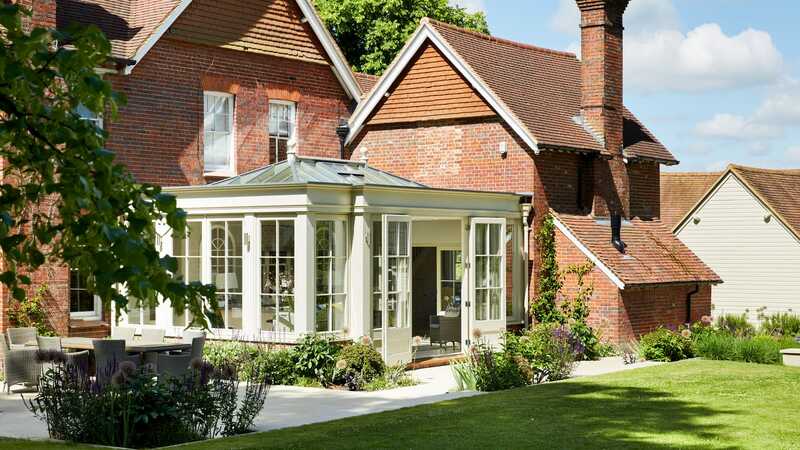 Whilst our new orangery certainly provides a bright and generous extension to our home, our main objective was to bring character to our pleasant but otherwise unremarkable property and we definitely feel we have achieved this through Westbury. Due to the size of the orangery, Jonathan, the founder of Westbury Garden Rooms, suggested that we needed a focal point to bring balance to such a large space. 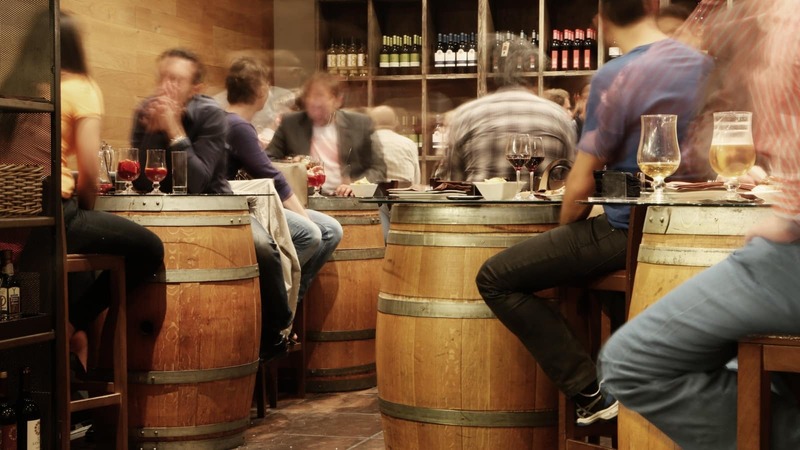 It was these little pieces of professional advice and considerations we hadn’t even thought of that made working with Westbury such an enjoyable experience. As I love to read, an integrated bookcase seemed the perfect solution. 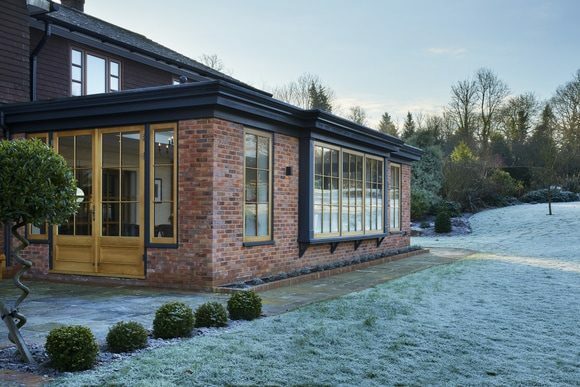 The finished product is stunning; the oak wood and Westbury black paint mirrors the joinery of the orangery windows, providing a beautiful contrast to the neutral stone colours of the interior design. Jonathan also suggested we incorporate window seats into our design creating another place to enjoy the views of the garden, or to sit in an evening and get lost in a good read. As the dimensions of our orangery are very different from the previous conservatory, we found that there was a small square of outdoor space that now serves as a charming courtyard. It can be enjoyed as an extension of the orangery but also has a really intimate ‘secret garden’ feel about it. The aftercare provided by the team has been invaluable. Every member of the team was encouraging and responsive throughout the process and even after completion we still feel supported which is a level of service you can’t put a price on. 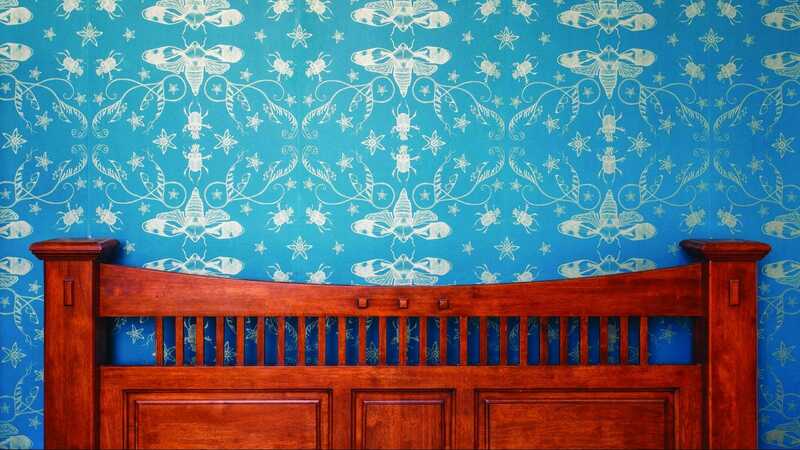 See more images of Mrs. B’s reading room orangery. From time to time, we ask our customers to write for our blog. 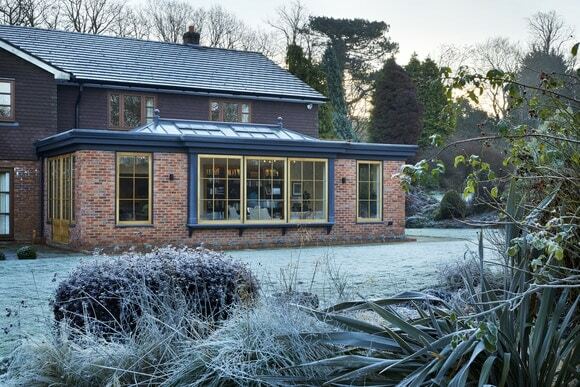 Here’s Mrs Q. on how an orangery has enhanced her Victorian family home.